The appearance of the successful self-propelled torpedo occurred in the mid-1870s, at the same time as light, efficient steam engines allowed the development of a new type of warship, the torpedo boat. Fast by the standards of the time – typically 18 to 20 knots – and cheap to build, these small vessels carried a weapon that, for the first time, allowed attack below the waterline. To this, even the most heavily armoured ships were vulnerable. Some nations, such as France, which remained a possible enemy for Britain in any war likely at this time, saw flotillas of such gunboats as an economic and effective way of countering the numerical advantages of a larger navy. In the French navy this concept was central to the strategy advocated by the so calledJeune École, and other nations, including many smaller ones, followed suit. Swarms of torpedo boats were believed capable of swamping the onboard defences of their targets and, as when the airborne attack emerged as a threat in the 1920s, many came to believe that the day of armoured units, particularly battleships, was over. Though early torpedo boats were suited to inshore use only – as for defence of ports and naval bases – size and sea-keeping ability increased through the 1880s, thus allowing more aggressive deployment. 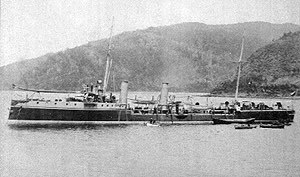 Typical of such larger boats was the Falke, built by the British company Yarrow for the Austro-Hungarian Navy in 1885 and carrying two torpedo tubes and two 37mm quick-firing guns. 135 feet long and displacing 100 tons, she was capable of 22 knots at a time when the fastest armoured ships were lucky to make 16. Protection of heavy units against torpedo boat attack consisted of what today would be regarded as both “point defence” and “area defence”. In the former case the objective was to destroy any attacker that had come close to an individual ship. Effective weapons were available for this, in the form of Gatling, Nordenvelt and Gardner semiautomatic weapons of up to one inch calibre which were well capable of tearing a lightly constructed torpedo craft apart in a hail of fire. The solution to this was to swamp the target ship by simultaneous attack from different directions. Countering this meant area defence by craft that were capable of detecting and breaking up such swarms of attackers, ideally long before they could reach heavier units. Given that the Royal Navy had the most to protect, it was not surprising that it was the first navy to develop a counter to the threat. This was in the form of the “torpedo gunboat”, essentially a small cruiser armed both with torpedoes and with heavier guns than those of any torpedo boat, and were of a size that guaranteed superior sea-keeping capability. The Royal Navy was to build 33 such units between 1885 and 1894. The Alarm class of the late ‘80s was perhaps typical of the type as a whole. 230 feet long and of 810 tons, she carried five torpedo tubes, which gave a useful offensive capability against larger ships, and a heavy gun armament for dealing with torpedo craft – two 4.7 inch guns, located fore and aft, as well as smaller quick-firers and Gardner semi-automatics. Like others of the type the eleven Alarms were handsome ships, all the more when seen in black, white and buff Victorian livery. Any torpedo boat that came within range of such a unit was to have only short life expectancy. The problem was however to get within range for the typical torpedo-gun boat was slower by two to three knots, and significantly less maneuverable than the craft they were designed to hunt down and kill. By the mid ‘90s this fact had been amply demonstrated in exercises and another solution was needed to counter the torpedo boat threat. The answer was to be a “super torpedo boat”, larger and faster and carrying heavier armament, becoming in the process a “torpedo boat destroyer” and the progenitor of the ever larger destroyers that were to play such key roles in both world wars. The torpedo gunboats were quickly made obsolete by these new destroyers though, as well-built craft some were to survive in secondary roles, as depots, patrol craft or minesweepers and play useful roles in the Great War, being broken up in the early 1920s. This eclipsing of the torpedo-gunboat by the more spectacular destroyer as resulted in them having received a bad press over the years, and they are usually regarded as a misguided concept and a technical dead end. This evaluation, though harsh, is correct. Depressing as this record of mediocrity might be, one torpedo gunboat was to prove very successful, and indeed make naval history in an unlikely location – Chile. Throughout the 19th Century, in the aftermath of gaining independence from Spain and Portugal, Latin American nations engaged in an endless series of wars and civil wars. Some were very large-scale affairs, such as the Tri-Partite War of the 1860s in which Paraguay was devastated in a conflict with Brazil, Argentine and Uruguay, while others such as the War of the Pacific from 1879 to 1883, which lost Bolivia its coastline, still have reverberations today. In many of these conflicts naval forces played important roles since South American nations had an almost insatiable appetite for buying expensive warships overseas, whether they could afford them or not. The Chilean Civil War of 1891, though forgotten outside Chile today, was in its own right a substantial and murderous conflict. It pitted forces supporting the republic’s Congress against those of the sitting President, José Manuel Balmaceda for reasons that will not be enlarged upon here. At the start of the conflict the Chilean Army aligned itself with the President, and the Chilean Navy with the Congress, but as the conflict developed both sides acquired their own land and sea forces. The most important unit of the rebellious navy was the armored frigate Blanco Encalada, built in Britain in 1875. Of 3500 tons, and mounting six 9-inch guns and many smaller, she had already played an active role on the War of the Pacific, her most notable achievement being the capture of the Peruvian monitor Huáscar (which is still preserved in Chile today). 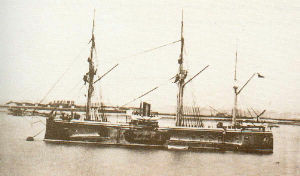 Supported by smaller vessels, she was in a position to dominate the Chilean coastline in the 1891 civil war, and indeed did so in the first months of the conflict. Control of coastal waters allowed troops to be transported by sea and landed anywhere required along Chile’s very long coastline. The game changer was however to be the arrival from Britain of two newly built torpedo gunboats, theAlmirante Lynch and the Almirante Condell, generally similar to the Royal Navy’s Sharpshooter and Alarmclasses. They carried five torpedo tubes as well as three 3-inch guns, plus smaller weapons. Crewed by Chileans, the vessels arrived at Valparaiso on April 18th and their commanders pledged to support President Balmaceda. He now had the two must modern warships in Chilean waters at his disposal, small though they might be compared with obsolescent Blanco Encalada which had been designed before vulnerability to torpedo attack needed to be taken into account. Sometime later news arrived of the Blanco Encalada supporting a landing by rebel troops at Caldera Bay, 450 miles to the north, were there were railroad and mining installations of high economic value. The newly arrived torpedo gunboats now headed north, followed by an armed steamer, apparently impressed from merchant service, called the Imperial. In the early hours of April 23rd the torpedo gunboats entered the Caldera anchorage and drove straight for the Blanco Encalada . Surprise seems to have been total – there are obvious similarities of the Japanese attack on Russian ships at Port Arthur in 1904. Both attackers got within 500 yards of theBlanco Encalada before her defensive weapons opened fire on them. The Almirante Condell launched a torpedo from her bow tube at 100 yards but it missed and exploded on the shore beyond. Turning away, the Condell launched from both her starboard tubes, one hitting but failing to explode, the second passing harmlessly straight under the Blanco Encalada. The Almirante Condell was now the target of all the Blanco Encalada’s guns, deflecting attention from the approach of the Almirante Lynch. At 50 yards range she fired her bow torpedo and missed but then, turning away, launched from her forward starboard tube. This torpedo found its mark, blasting a hole later found to be 7 feet by 15 below the Blanco Encalada’s waterline. Within two minutes of the strike the Blanco Encalada had sunk and her escaping crew, and a transport that had come to their aid, were brought under fire from the Almirante Condell and Almirante Lynch’s 3-pounder Hotchkiss quick firers. Only 106 men out of the 288 on board survived. As the victorious torpedo gunboats left the harbor they spotted a transport, the Aconcagua, which they attacked with their 3-inch guns, capturing her after an hour and a half battle, but abandoning her when they sighted a large vessel approaching which they feared might be the rebel cruiser Esmeralda. In the event their caution was unjustified as she proved to be the neutral Royal Navy’s HMS Warspite. A later attack by the two torpedo gunboats on another ironclad, the Almirante Cochrane, was unsuccessful and no torpedoes were launched. 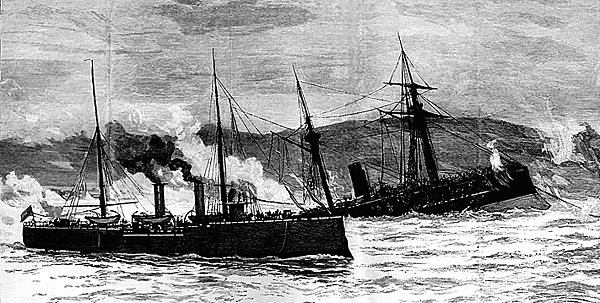 The Almirante Lynch had made history by making the Blanco Encalada the first warship to be sunk by a self-propelled torpedo. What is notable is however how many torpedoes launched from very close range missed their target before success was finally scored. This may well have been due to inadequate adjustment of the depth-keeping mechanism and of the fixed rudders – azimuth stabilisation by gyro being still far in the future. In the larger navies each torpedo was individually test- launched, not once but many times, and fine adjustments were made to ensure straight running. It is unlikely that the Chilean forces would have had the time to do this. 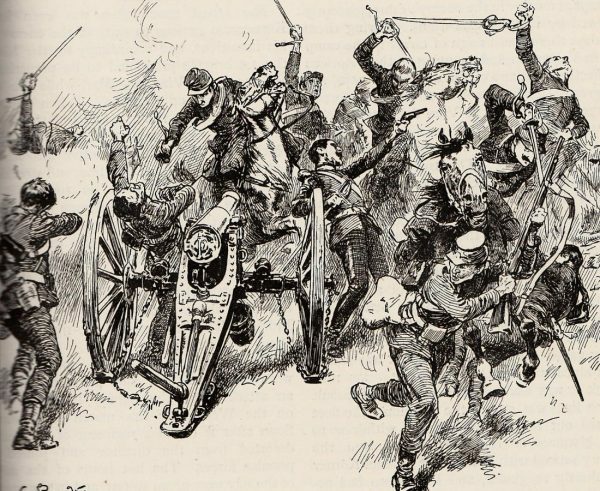 And as for the Civil War – did any of this at all matter? Probably not really. The war was ultimately to be won on land, and by the Congressional forces, in the bloody battle of La Placilla, South East of Valparaiso. The President’s army was practically annihilated, 941 being killed, including it commanding general and his deputy and 2,402 wounded. The Congressional army lost over 1,800. President Balmaceda, in despair, shot himself thereafter and the rebels took over government, initiating so-called “pseudo-parliamentary” period in Chile’s history, which lasted from 1891 to 1925. And now, a century and a quarter later, one almost weeps at the futility of it all.